New products in the pipeline? The leaked images were posted at Zatz Not Funny, but with no official comment from Ecobee yet, we'd take them with the usual grain or two or salt for now. 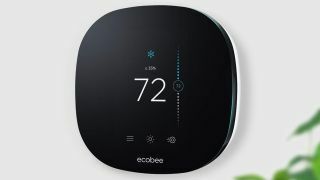 That said, it would make sense for Ecobee to want to add a camera to go alongside the smart thermostat it's mostly known for, and the smart light switch it recently added to its product range. As for pricing, or a launch date, or any of the specs of the device, there's no word on any of that at the moment. Based on Ecobee's existing products, it seems likely that Amazon Alexa and Google Assistant integration would be included. What's certain is that the smart home space continues to get busier and more competitive, so Ecobee will be feeling the pressure to keep up with its competitors. A lot of Ecobee's rivals in the smart thermostat space, including Nest and Hive, also have security cameras to their name, so Ecobee would be keeping pace with its main competitors at least – if a camera launch is on the cards. We'll have to wait and see if an Ecobee-made security camera appears to watch over your home, but for now the company is staying tight-lipped.